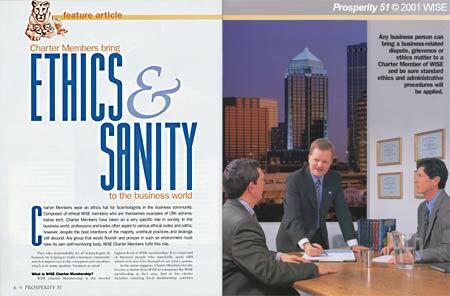 Charter Members wear an ethics hat for Scientologists in the business community. Composed of ethical WISE members who are themselves examples of LRH administrative tech, Charter Members have taken on a very specific role in society. In the business world, professions and trades often aspire to various ethical codes and oaths; however, despite the best intentions of the majority, unethical practices and dealings still abound. Any group that would flourish and prosper 1 to in such an environment must have its own self-monitoring body. WISE Charter Members fulfill this role. What is WISE Charter Membership? 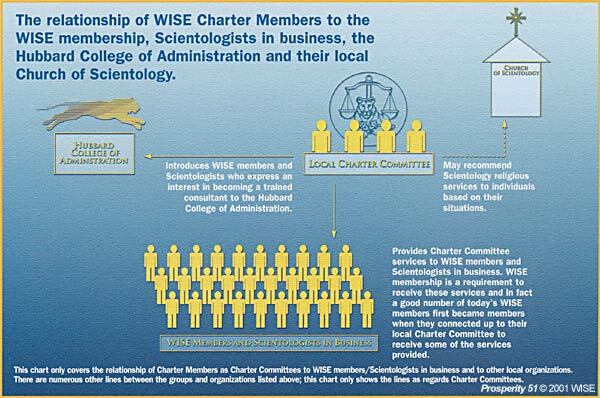 WISE Charter Membership is the second highest level of WISE membership. It is composed of business people who standardly apply LRH admin tech and who themselves are ethics upstats. As the name suggests, Charter Members literally receive a charter from WISE to administer the WISE membership in their area. And as this charter includes ensuring local membership activities expand, Charter Members reach out to assist all Scientologists in business in their local community. What are the activities of WISE Charter Members? Charter Members form up in their local areas as Charter Committees. As a group, they provide services to their local community. These services include ethics handlings, dispute handlings, assisting members to complete the Model of Admin Know-How programs and in some cases consulting actions. WISE, the World Institute of Scientology Enterprises, is a non-profit religious fellowship, and as such is in the main composed of Scientologists. As members of a Scientology religious fellowship, Charter Members assist Scientologists with regard to business-related activities while naturally referring them to their church for matters of a more personal or spiritual nature. There are also many non-Scientologists who, wishing to benefit from LRH admin tech, use WISE membership to implement this technology into their companies. They can, of course, also avail themselves of all the services provided by their local Charter Committee and can keep their own counsel as regards personal aspects of their lives. Example 1. A WISE member finds himself involved in a business dispute with another business person. Despite attempts, it has not resolved. “I came to this procedure with a lot of hesitation but with a full trust of LRH tech. The procedure was amazing, as were the results. “In the course of the dispute handling I cognited on the main reasons I caused this whole thing in the first place. And I have already formulated a policy to not go that route again. “It feels good to have handled the long term situation finally and have it done. It took some confront but needed to be pushed through. Example 2. A Scientologist finds himself the effect of some situation in business; so much so, that it is consuming his time, damaging his family life and thwarting his spiritual progress. 3 His local Charter Committee helps him sort out this business situation using tools of ethics and assists him to get LRH admin tech implemented with the Model of Admin Know-How programs, so that the true source of the situation is addressed. This is all done in coordination with the local Church of Scientology and without cutting across the time he would usually spend advancing spiritually. The above two examples give somewhat of an idea of the activities of a Charter Committee; however, there are innumerable possibilities where a Charter Committee can assist. The guiding rule is: where it is a business matter, it is the concern of a Charter Member. And when, as a Charter Member, you confront the breadth of this, one’s responsibilities broaden but also simplify greatly. Many Charter Members, in addition to assisting their local community of WISE members and Scientologists in business, see to the broad dissemination of LRH admin tech through seminars and local outreach activities. In fact, many a Charter Member is also a full time LRH admin tech consultant. What Does it Take to Be a Charter Member? Being a Charter Member means taking responsibility for your local community, for Scientologists in business, for WISE members in your area. That means seeing to it that they succeed through the standard application of LRH admin tech and being always ready to assist with the tech of ethics and dispute handling where needed. There are specific qualifications in order to become a Charter Member and one definitely must be able to apply LRH admin tech to the letter and be an ethics upstat. However, senior to these is one’s desire to help others and take responsibility for the standard application of LRH tech in one’s community. A specific training lineup exists for Charter Members which ensures they are fully competent in the handling of ethics and dispute handlings. This training is done in four stages. The first stage gives one rapid training to handle the common situations encountered. The successive stages of training following this include the Hubbard Ethics Specialist Course as well as the PTS/SP Course and a study of the basic books. The end product is a Charter Member who is totally at cause when it comes to handling business-related situations amongst WISE members and Scientologists in their community. Charter Members are also provided with special hatting materials from WISE which cover the exact procedures for handling disputes, administering ethics and establishing a functional Charter Committee. Charter Members play a vital role in their community. Business people are continually interacting with a commercial world which is itself rife with out-ethics and immorality. There are constantly decisions to be made and when people are not trained in the tech of ethics and not competent administrators, then choices can be incorrect, situations can become tangled and the best of plans go awry. In areas lacking LRH tech, there’s little recourse; through Charter Committees the solutions are right to hand, always sane, uniformly workable and everyone wins!